Turns out, that procrastination choice was not a huge mistake. Actually, it was incredibly well-timed. I already sort of knew that because the internet has been going insane as the launch of the Netflix reboot gets closer. But I didn’t know that just four days after I finished my Arrested Development marathon, the show would be setting up shop in Leicester Square. It literally took me less than ten minutes on Wednesday night to read about the event, process what was happening, and find myself staring at a Southern booking confirmation page for a spontaneous trip to London the next day — some next-level TV-related procrastination. I’m not a spontaneous person. I’m a neurotic, ultra-type-A person. But for my favorite TV shows, it’s been proven that I’ll pick up and go sleep on 49th Street in Manhattan (twice, 30 Rock tickets) or wander around DC in 100-degree weather for hours (last year, Parks & Rec location shots) or, apparently, sacrifice a day of paper-writing to go wait in line to take a photo inside the banana stand (yesterday). And all of these things have paid off! 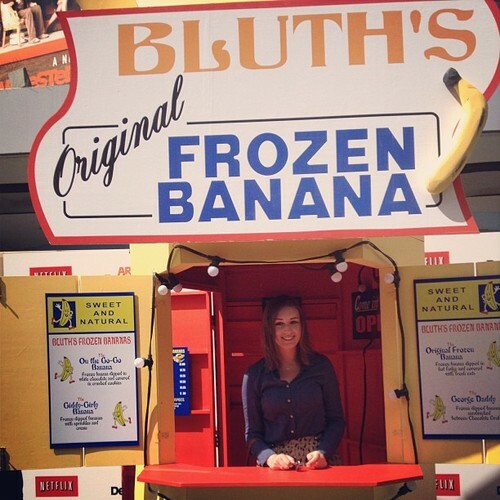 I went to both 30 Rock live shows and met most of the cast, I got in the background of some Parks shots that I’m praying will be in the deleted scenes on this season’s DVD, and of course I have a photo of myself standing inside the world-famous Bluth’s banana stand. I didn’t stick around for the premiere later yesterday evening, sadly, but that’s only because I met up with a couple of friends (worth it) and we wound up with Martin Starr sitting a few yards away from us in a Soho coffee shop (very much worth it). Success all around! Well, not so much on the academic front — but there’s still time for that. If you’re interested in avoiding your own schoolwork (or family, or employment, or whatever) by tracking down this cult pop culture icon and you live in London, New York, or LA, you’re in luck! The banana stand will be on the move in the next couple of weeks before the Arrested Development reboot launches on Netlix — go forth and stalk the hell out of @ArrestedDev on Twitter for info.